The Russian embassy in Canada calls Prime Minister Justin Trudeau's comments criticising Vladimir Putin 'confrontational rhetoric' on Twitter. Trudeau said on Wednesday during a Toronto press conference that Putin needs to start playing a more positive role in the world on a variety of fronts, from Ukraine, to Syria, to the Arctic, as well as answering for Russia's role in the nerve gas attack in Britain two weeks ago. We regret PM Trudeau’s confrontational rhetoric at yesterday’s Toronto press-conference prompted by UK slanderous Russophobic hysteria. This language of ultimatums is totally unacceptable &amp; counterproductive, especially for bilateral dialogue on important issues, like the Arctic. 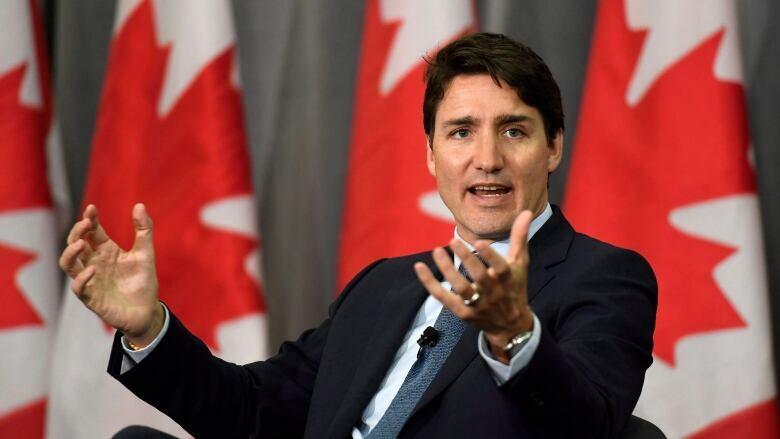 Trudeau's remarks came after several recent warnings about possible Russian interference in the 2019 Canadian federal election from eastern European diplomats in Ottawa, as well as a top NATO researcher. Trudeau listed some positive behaviour he said he'd like to see from Putin. "Whether it's pulling back of his engagement in the Donbass or leaving Crimea," the prime minister said, "whether it's taking responsibility for . . . the important questions that the U.K. has asked after the terrible poisoning incident a few weeks ago in Salisbury, whether it's questions around NATO, questions around Syria, questions around the Arctic." The House of Commons unanimously adopted a motion this week that blames Russia for what it calls a despicable nerve gas attack in Britain that hospitalized former double agent Sergei Skripal and his daughter Yulia in the city of Salisbury. The British government says they were victims of a Russian nerve agent. Trudeau's final example of the Arctic drew the ire of the Russian Embassy in its tweet. The Arctic is one area where the two countries have tried to co-operate through the Arctic Council and bilaterally. "We regret PM Trudeau's confrontational rhetoric at yesterday's Toronto press-conference prompted by UK slanderous Russophobic hysteria," said Thursday's tweet. "This language of ultimatums is totally unacceptable & counterproductive, especially for bilateral dialogue on important issues, like the Arctic." Trudeau's office did not reply to a request for comment on why he included a reference to the Arctic in his remarks, or whether Canada's Arctic policy had taken a negative turn with Russia. "The prime minister made a tiny mistake and a junior diplomat picked up on it. End of story," said Byers, the Canada Research Chair in Global Politics and International Law at the University of British Columbia. "The Arctic is one of just a couple of places where Russian-Western co-operation remains good." Byers also said no weight should be attached to the fact the statement was made on a Twitter account linked to the Russian Embassy. He said the account is run by a press secretary "who is a very active tweeter — you might even call him a troll." "Yes, he is an employee of the Russian foreign ministry, but he is a long way from the centre."